Ford drops F-bomb on Focus RS owner (epic customer service 'fail') — Auto Expert by John Cadogan - save thousands on your next new car! Social media moments don’t get much more deliciously awkward than this: It’s been alleged on Facebook that a Ford service manager called a Focus RS owner a very rude name indeed when the voicemail recording continued, inconveniently, after the service manager presumed he had ended the call. Now, I’d be the first to admit that internet scams abound, and this could all be an elaborate fake. But if it’s not, I think most of us would agree that, like many aspects of inter-personal communication, letting the other party in on your true feelings is a speed hump n the road to achieving the resolution you want. The customer is Xander Svetman, who posted the increasingly popular alleged recording on Facebook, where it earned 1200 likes, 800 comments and 500 shares. A tidy piece of Ford anti-marketing, any way you look at it. I wonder if the dealer has a ‘bringing the brand into disrepute’ termination clause in its franchise agreement? Probably. The dealership where the F-bomb exploded is allegedly Titan Ford in the beachside Sydney suburb of Brookvale. Mr Svetman claims he is the third person to purchase an RS from the dealership after an agonising nine-month wait. And he gets it serviced there, loyally enough. Imagine Mr Svetman’s despair when he learned the base engine block for the RS has the dodgiest possible design for a high-performance engine: the floating deck, where the cylinders are unsupported at the top of the block, which allows them to move relative to the head, and destroy the head gasket, inconveniently. Like me you might wonder why this was never picked up by Ford’s engineers in R&D. There’s no good answer to this question. Because all answers I can see are orbiting around planet Incompetence. This floating deck accounts for the global epidemic of Focii RS emitting clouds of white water vapour on their way down the road - yet another example of Ford’s commitment to under-done engineering design. I get the sense that the dealership basically brushed Mr Svetman when he wanted the fix implemented - it’s not really a ‘fix’; more like a ‘temporary repair’, a deferment of the inevitable - anyway, they brushed him until April, and I got a sense communications went south at this point. That good, old fashioned Ford customer care. Yes! Of course, I have no way to confirm that the post or the recording is authentic. It may be a misrepresentation of the truth. But adding weight to my impression that, on the balance of probabilities, it probably is genuine, is the fact that it’s been up for several days, and if it were fake there are probably solid grounds to coerce its removal. Teenage Rupert Ninja Turtle, yesterday. Hero in a half-shell. And then there’s Alexis Carey, a journalist who works for media magnate and founding member of the teenage mutant ninja turtles, Rupert Murdoch. When Ms Carey reported on this for the Daily Telegraph (which is not quite the UK’s awesome Sunday Sport tabloid) … but it is close. This leads me to conclude that there’s most probably no real dispute about the unfortunate F-bomb voicemail. I mean, it’s hardly disappointing if it didn’t actually happen, right? Still, more than anywhere else, this statement by Ms Mobarek is where I have to disagree vehemently with Ford’s 2IC of spin doctoring the facts. In my opinion, calling us all fuckwits (at least implicitly) is exactly in line with Ford’s values and expectations. Ford has been F-bombing us all, for decades. Ford dropped the F-bomb on the Australian taxpayer when it took all those government grants - billions of our cash - and still failed to honour its moral obligation to support Australian manufacturing jobs. The company deployed another epic F-bomb with its outrageous party at Fox Studios to celebrate the rosy post-manufacturing future. There has been carpet F-bombing over the infamous PowerShit Transmission, with the dodgiest clutch pack design ever. Anyone who cares about road safety was F-bombed when Ford deployed ‘Any F-wit Can Drift’ mode in the Focus RS, and anyone who bought one was F-bombed in the manner of Mr Svetman over the spectacularly under-engineered engine block in that high-performance shitheap. 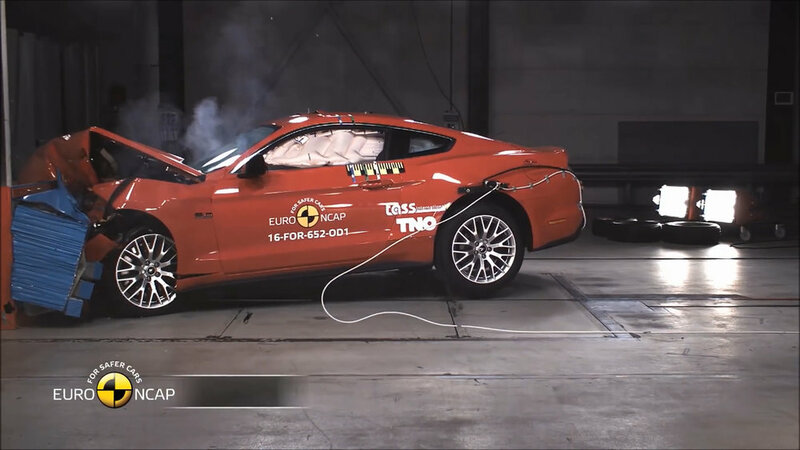 The Mustang - an F-bomb as a safety disgrace. Full story >> Might as well be a Proton in a crash, plus the disgracefully cynical strip-out of safety assistance features for Australia and Europe. Another brick in the F-bomb wall. You should not do that to the halo car. You Muppets. They’re still selling the Ranger with this known life-threatening safety defect - and they have been all bushfire season - tell me that’s not yet another spectacular Ford F-bomb, right up in yo’ face. This implicit, under the table F-bomb blitzkrieg, which seems increasingly Ford’s forte, in line with its core values and expectations, despite spin central’s protestations to the contrary: I hate that. I mean, with Ford, you don’t even get a reach-around. And your intelligence is insulted. It’s disgraceful and undignified. Let me know in the comments feed below if you have been F-bombed by our blue oval friends. Subscribe to my YouTube channel >> I dare you. Just get on with it. We don’t need you any more.